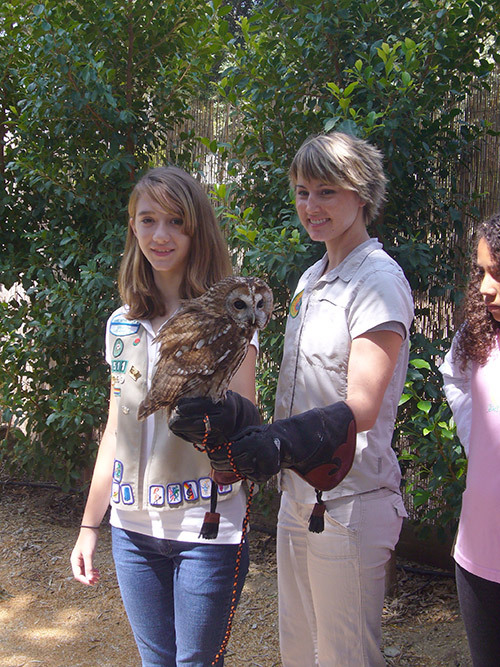 Bring your Girl or Boy Scout Troop to the Wildlife Learning Center for an amazing wildlife adventure! This two-hour, four station, wildlife immersion is available 7 days a week. Depending on the size of your troop, all the scouts will be divided into two, three or four groups. Each group will cycle through the four stations, learning about different areas of wildlife biology. Each station is led by one of our Wildlife Learning Center biologists. 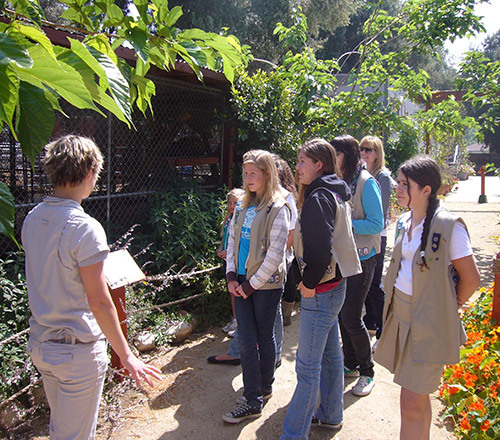 "The Wildlife Learning Center offers Girl Scouts a unique opportunity to observe animals closely. Girls get to see, touch and handle animals which is truly a valuable experience. The staff is kid friendly, engaging and informative. When you put passionate staff and animals together with Girl Scouts who just love animals, magic happens. I would recommend setting up badge dates. They know the program. The have the information. They're Wonderful!!" 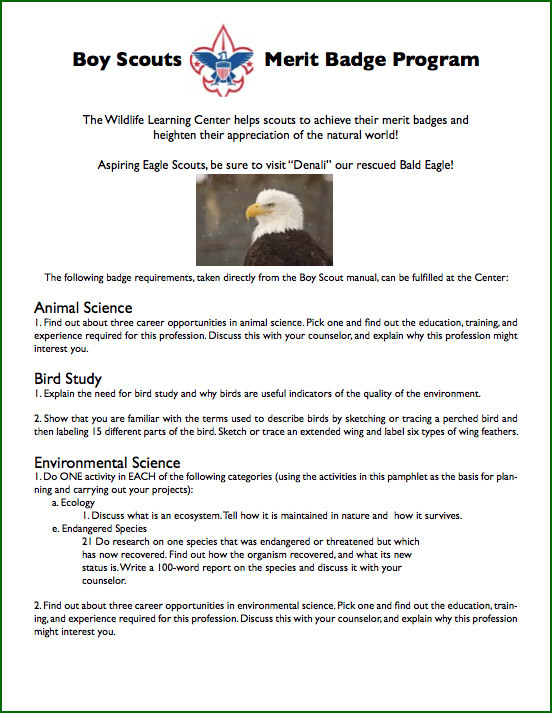 Bring your Girl or Boy Scout Troop to Wildlife Learning Center for an amazing wildlife adventure! This 1 1/2 hour, four station, wildlife immersion is available 7 days a week. Depending on the size of your troop, the scouts will be put into one or two groups. Each group will cycle through the four stations, learning about different areas of wildlife biology. Each station is led by one of our friendly WLC biologists. This station is an orientation of the outdoor habitats and the reptile, amphibian, and arthropod room. The troop will observe over 50 species of exotic and native wildlife! The basics of animal husbandry are explored at this station. Scouts will learn how we monitor each animal’s health and how we feed each of our carnivores, omnivores, and herbivores specialized diets. Scouts will meet a variety of animals and learn about the characteristics of mammals, birds, reptiles, amphibians, and arthropods. Students will examine intriguing biofacts, touch certain animals, and questions are encouraged! This station introduces scouts to the importance of stimulating an animal’s natural behaviors through behavioral enrichment. Each scout will create an enrichment item and then observe the animals enjoying their new “toys”. Each station is approximately 20-25 minutes. Please encourage children to wear close-toed shoes. Our gazebo can be reserved for your group to enjoy lunch after your tour. Please make reservations in advance. $50 for each 1/2 stay. For larger groups please contact our office. A $50 deposit is due at the time of scheduling. These prices are subject to change. MANY BOY SCOUT MERIT MERIT BADGE REQUIREMENTS CAN BE MET AT THE CENTER. 1. If a leader or adult in your troop is knowledgeable about the specific badge(s) your son would like to achieve, they are welcome to come as general admission guests ($7 children/ $9 adults) and self-guide throughout the Center. If your Troop is interested, Our Four-Station Tour is very popular. The details of that experience are just above the Boy Scout Merit Badge section. Additionally, the Center offers wonderful overnight scout camping opportunities. If this is something you may be interested in, please contact our office. Many of the biologists at the Center are Boy and Girl Scout alumni!